BCI Acrylic Inc. was founded in 1999 by Scott Rosenbach and Tom Barzantny. It is a home improvement company based in Palatine, Illinois and is the manufacturer of all of Bath Planet’s products. Bath Planet, created in 2011, focuses exclusively on bathroom remodeling products. Bath Planet was founded with the intention of eliminating industry-wide inconsistencies between dealers and manufacturers operating in the home improvement field. The Bath Planet brand was created as a way to fill unmet needs and offer consumers a more positive experience when planning and executing a home improvement project. Bath Planet makes remodeling easy and stress-free, assigning an experienced design consultant to each customer. This professional project manager acts as a liaison between Bath Planet and the customer, keeping them informed of the bathroom project’s progress and ensuring clear communication from start to finish. Over 100 dealers have been qualified to offer Bath Planet products and installation. These dealers have been trained in proprietary procedures to ensure a consistent product throughout the U.S. and Canada. Certified installers are subject to numerous confirmations of their skill and operate under the supervision of expert craftsmen. Bath Planet is known for expedient installation, with most projects being completed in one day. In 2015, BCI Acrylics/Bath Planet co-founder Tom Barzantny retired, selling his shares of the business to Scott Rosenbach, who remains active as the sole owner. Rosenbach has been instrumental in the company’s growth, having initiated numerous successful marketing campaigns and adding additional product lines. BCI continues to meet the growing demands of its customers by exploring innovative bath and shower products, enhancing dealer training, and monitoring customer satisfaction at all levels. Bath Planet offers an extensive line of products including replacement bathtub and shower liners and has been reviewed by the Good Housekeeping Institute and where all Bath Planet products have earned the Good Housekeeping Seal. The Good Housekeeping Seal provides a third party, two year limited warranty. Bath Planet replacement bathtubs are a low maintenance option for homeowners wishing to replace their old outdated tub. They come in a variety of high-gloss acrylic colors and patterns that coordinate with most existing designs. Replacement tubs won’t fade, chip, stain, and scratch resistant. Bath liners are a convenient and affordable option for those looking to update an existing bathroom without the need to tear out the old bathtub. Bath Planet bath liners are custom molded out of ¼ inch thick acrylic. Wall surrounds, like bath liners, are thermoformed to fit over existing walls. They are built from nonporous material and free of grout lines. Made of strong, durable, and mildew resistant acrylic, Bath Planet replacement shower bases can quickly and easily replace an old worn-out shower floor. They may be used in existing shower areas or as part of a tub-to-shower conversion. Slip resistant acrylic shower liners are installed directly over an existing shower surface. Like other Bath Planet acrylic products, shower liners are molded from high quality acrylic and are a more affordable option compared to traditional remodeling. Bath Planet shower wall surrounds are designed to fit over existing walls. They extend from floor to ceiling. 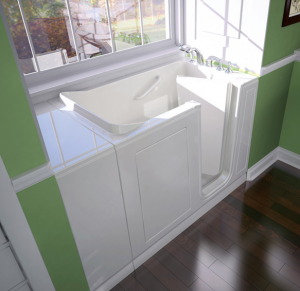 Walk-in bathtubs are a safe, affordable, and effective option for those affected by mobility issues. Bath Planet carries an extensive selection of walk-in tubs to fit into existing openings of all sizes. Walk in bathtubs are more spacious than traditional tubs and help reduce accidents. 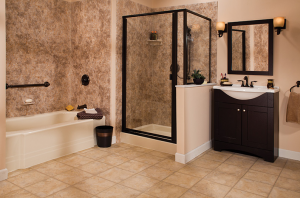 Bath Planet understands that many consumers simply prefer a shower over a bath – especially in a secondary bathroom. 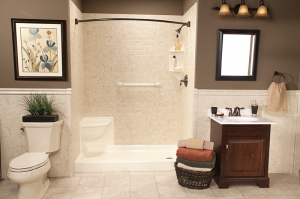 Tub-to-shower conversions are an economical way to get more functionality out of an underutilized lavatory. Those who like the look of a bathtub but prefer the functionality of the shower may choose a custom step-through insert. This is an affordable renovation option that allows Bath Planet to transform a bathtub into a convenient walk-in shower. Adding to the extensive line of accessibility products available through Bath Planet are the company’s custom barrier free shower bases. Wheelchair accessible showers ensure that people of all abilities have the option to enjoy a comfortable and safe bathing experience. Bath Planet offers five tub and shower base colors with 19 coordinating wall colors. Bathtubs are available in Sandbar, Biscuit, Almond, White, and Gray. Wall colors include Juparana Granite, Carrara Marble, Valencia, Rosa Slate, River Rock, Brecchia, Gray, Biscuit, Venetian Granite, Travertine, Canyon Slate, Roman Stone, Almond/White, Madiera Granite, Almond, White, Capri Granite, Silver/White, and Coastal Stone. Bath Planet believes that the character of a room is etched into the details. The company offers shower doors, rods, and accessories in a variety of finishes including white, satin chrome, polished gold, polished chrome, oil rubbed bronze, and brushed nickel. Soap dishes, shaving stands, corner caddies, and in-shower shelving units are also available.